I haven’t been out of LA for more than 53 hours since April. LA is a fantastic town that is full of desperate people — you need to get away from it regularly so the broken-dreams energy doesn’t eat you alive. My head and my heart were getting nibbled on. LOSERS draft 2 is going to be delivered today. New landscape = fresh perspective. It’s a reset trip. I’m transitioning into writer’s brain for my next assignment. I had a free ticket and one of my best friends lives in here. 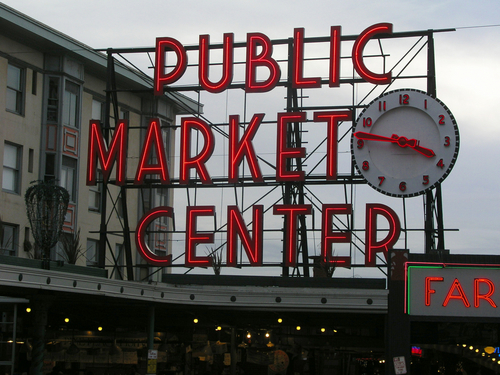 Hit Pike Place Market yesterday. Hoping for the Needle tomorrow. It’s not raining. This entry was posted on September 25, 2009 at 12:19 pm and is filed under The Way It Is. You can follow any responses to this entry through the RSS 2.0 feed. You can leave a response, or trackback from your own site.